Cactus Woods is a level in the Wild West World area in the game, DK: King of Swing. As well as Necky's Canyon, it can be the first or second level of the world. It, along with three other levels in the Wild West World, must be completed to unlock the boss stage, Fire Necky's Nest. This level takes place in a forest full of cacti. Therefore, the walls appear to be cactus-like, while the background shows several tall cacti. The obstacles in this level mainly include sharp spikes that line some walls, barrels, and tires (found only in the Bonus Level). As with most levels, there are also many pegs and peg boards throughout the stage, but in this level, they are all stationary. Cactus Woods is home to a few species of enemies, including Flitters, Zingers, who appear for the first time in the game here, and Click-Clacks, who make their only appearance in this level. As most levels, a Crystal Coconut, found in a Bonus Level, and a medal are located here. The level begins in an area with many pegs and peg boards. Peg boards are placed close together at the beginning of the area, while five more peg boards are located above, being positioned farther apart from each other. Each of these five peg boards have a banana on them, while all but one of the peg boards have four pegs surrounding them. A group of single pegs are above these five peg boards, and they have a pair of Flitters around them. 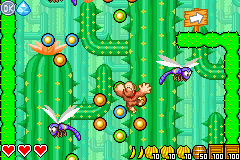 The Kong must maneuver around these foes to reach a trio of pegs above. A Banana Bunch floats above these pegs. There is a third Flitter nearby who flies around another trio of pegs that can be used to reach a ledge that leads into the second area of the level. A ledge farther upwards in this area also holds a Bonus Level (exclusively in the Donkey Kong mode), which can be entered to access a Bonus Level. Here, the hero must bounce between many tires to grab a great extent of bananas within the time limit of thirty seconds. Once they are all collected, a Crystal Coconut appears at the end of the stage. In the second section of the level, the Kong can find a large group of peg boards surrounding a lone barrel, which contains a Banana Bunch. Three Zingers fly around these peg boards. If the hero travels to the right at the top of this area, he can swing over a cactus-like pillar, which has razor-sharp spikes lined along parts of it, to progress of another peg board. Another cactus-like pillar stands near here with some spikes around it. If the primate heads downwards from this peg board and moves between the two pillars, he can make his way down to a barrel that can be destroyed to reveal a silver medal. Using a few pegs found farther above the medal, the Kong can climb over the previously mentioned cactus pillar to find another large group of peg boards. A barrel containing a Banana Bunch is in the center of the group, while four Zingers fly all around it. A trio of bananas also hang below all of the peg boards above some spikes. In the top-right corner of the area, the hero can find a ledge that leads into the third area of the level. Here, two peg boards found next to each other can be found. Three pegs are above them, as well as a barrel that must be destroyed to progress. The Kong can swing and glide his way upwards to reach a group of nine peg boards, with three peg boards placed in each of the three rows. Two Click-Clacks march along the boards for the primate to avoid. A banana can also be found on the first peg board. If the hero manages to pass the insects and travels to the top of the boards, he can find another barrel that he must break to progress, as the object is blocking his way. Once he climbs upwards, he can find another set of peg boards, which are set up identically to the previous boards. This time, a set of three Click-Clacks attack the Kong on the peg boards. If they are all dodged, the primate can reach a barrel above the peg board in the top-left corner of the area that he can break to open the way to a higher area. Here, there are a few more pegs leading up to a pair of peg boards above some spikes. An exit sign is visible to the right of here. If the sign is landed by, the level is completed. Found near the exit of the first area. Donkey Kong will have thirty seconds to collect all of the bananas in an area full of bouncy tires. A Crystal Coconut will be rewarded for doing so. This page was last edited on April 5, 2019, at 12:46.